Most of you know by now that Ben and I are engaged. But most of you haven’t heard the story. I won’t say much, but I thought it would be good to show my four rings. We got engaged on a walk by the lake with an insanely cold wind. Apparently, we were supposed to go on the walk a few nights earlier, when it was clear and warm, but I was stubborn and didn’t go. So it was cold and windy. Ben proposed using a ring that I’d bought for $10 at Claire’s a few years ago. 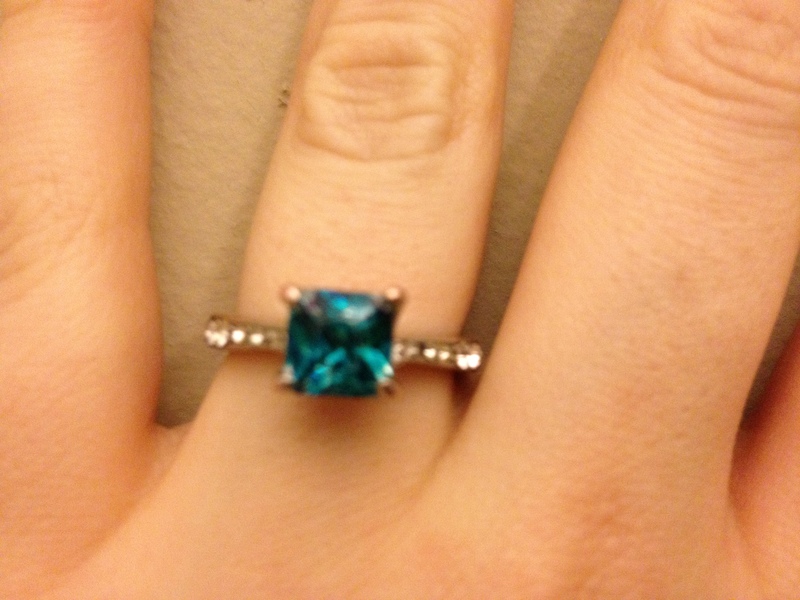 I bought it in order to have a ring when I went out dancing or traveling. Basically then I could pretend I was engaged and ward off loser dudes. My hand looks weird in this picture. Basically it was a ginormous fake diamond surrounded by little diamonds. The next night we were watching a movie. Ben took a Lindt Dark Chocolate Truffle and peeled the tin foil off of the plastic. 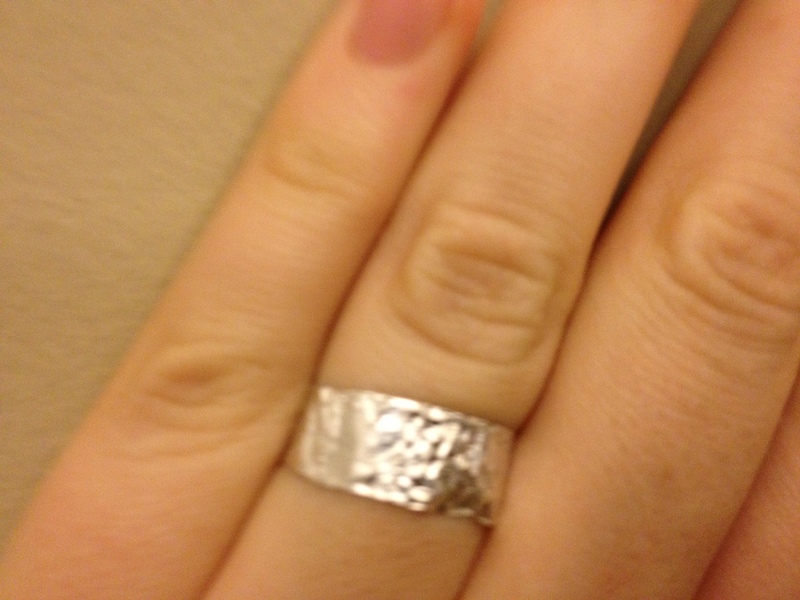 Then he made me another ring from the truffle wrapper. 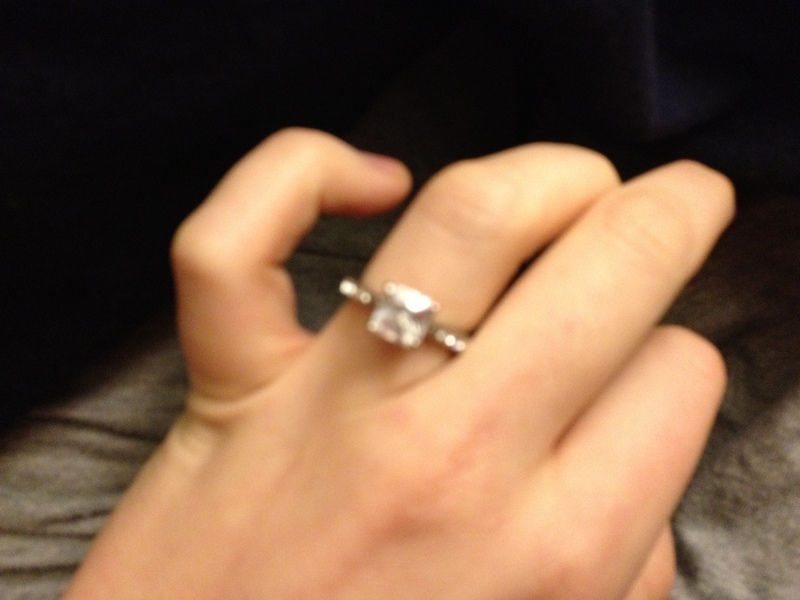 During this time, we were looking at rings online, but had trouble finding things we liked. Then I saw Ben at his desk with a hot glue gun. He was making a ring out of a paper clip, blue bead, fishing line, and hot glue. When this picture was taken the fishing line had broken and the hot glue was peeling. 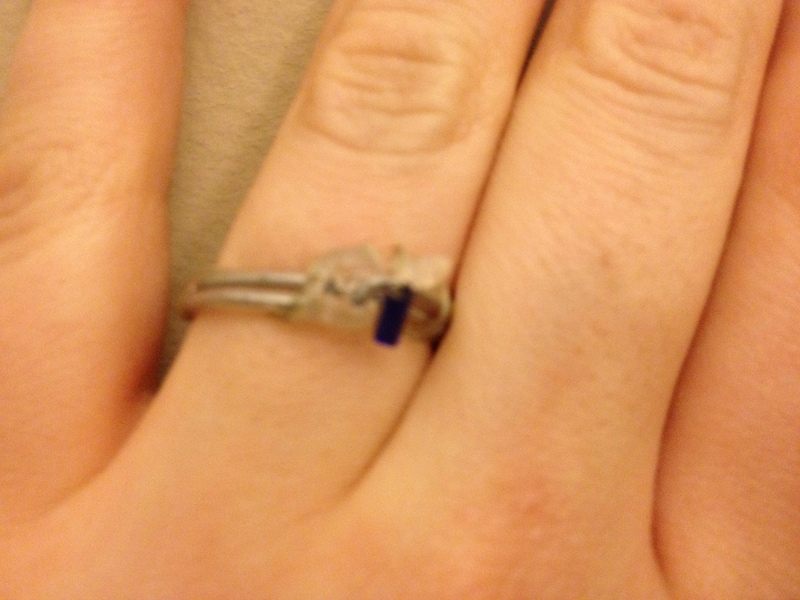 Then we went to our local jeweler and found out that you can color diamonds with magic markers. 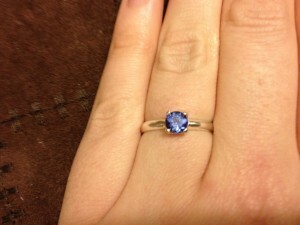 At the jewelers, since we were looking at sapphires, the lady whipped out a blue sharpie and started coloring diamonds. This was a radical notion to us. My Claire’s ring, it turns out, was much more palatable as a “sapphire.” But I didn’t take pictures of that. Every few days it needed touching up, so one day we just made it an emerald. But none of these rings were supposed to be permanent. 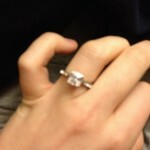 And, as much as I liked the rings from Knox Jewelers, I couldn’t see paying that much for a ring. And it seemed like even half that much (for a compromise ring) wasn’t that great an idea. So we got creative. Ben was sad that my finger wan’t size 5. There were size 5 rings on sale at Sears for $20. But alas, my finger was bigger than that. Then we went to Etsy. Ah, etsy! Etsy had a perfect ring. Perfect size, perfect stone, perfect price (and sparkly!!). Yay for CavalierCreations! And so that is the ring that I wear every day. First: Obama sushi. This seems like a lot of work for sushi. Plus sushi with shrimp, black sesame, and fish paste just doesn’t sound all that appetizing to me. 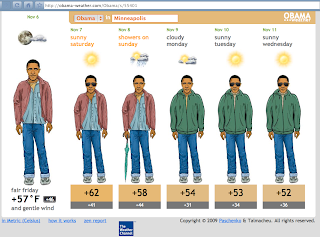 Second: Obama weather predictor. Want to find out what the weather is like and what you should wear? Ask obama-weather.com. (You can also get Bender, House, or Angelina to model weather appropriate clothing for you.) Using this site will also tell you if you should wear sunglasses or lean on an umbrella like a cane. Very useful stuff. Third: Not Obama related. Completely apolitical. But science-y. If you watch The Big Bang Theory, you may be interested to know that the science consultant behind the show, physics professor David Saltzberg, runs a blog called The Big Blog Theory which goes more in depth about the science for each episode. Interesting and scientific, but aimed at a mainstream audience. Peter Sagal had a piece on NPR today about email addiction. I understand completely where he’s coming from! Although I think my fantasy email is less Justice League of America and more that someone wants to offer me a immense fellowship to travel the world or wants to put me on NPR. Ben’s flying in tomorrow and so we’re going to spend some time in San Francisco. Just in time, this piece on “farmer’s market fast food” appeared on Mark Bittman’s NYTimes blog, Bitten. I think that we’ll be making a stop at the Ferry Building market as well as a dim sum place. In addition, Bittman posted a recipe for Pasta with Corn, Zucchini, and Tomatoes. Personally, I like my corn best fresh, briefly boiled and eaten with either salt and butter or lime and chili. But if there’s an overabundance I’m ok with eating it other ways as well. Speaking of TV: I’ve been thinking a lot about the 2004 Olympics. This is primarily because I’m not watching the 2008 Olympics. It’s not that I’m protesting China, not at all, it’s a convenience thing. I don’t have a tv here and I have a 40+ hour a week job. In 2004, I had just finished my job in Letcher County and I was sitting at home in front of the TV working on my scrapbook while watching the Olympics. I even remember watching the opening ceremonies with a group of college friends that I didn’t usually hang out with. It’s strange to think how much my life has changed since then. That’s it for today folks. I’ll probably not post this weekend, but should be back to normal next week. I’ve got 11 more days of my internship and then it’s back to grad school. Update: I added a bonus picture for those of you who made it this whole way! Here’s a picture from back in 2004 during my terms in York. This was taken from my dorm room window during exam week in April. I’ve been delaying writing because I have been dreading going back and reading the 200+ articles in Google Reader. So today I finally went through the StarTribune, NYTimes, and Slashdot articles from the past week that I thought might be interesting. The range from the absurd to the more serious. Serious items are starred. *Why does free software have poor usability? Also from the NYTimes are two more articles. These deserve a little more space and time. First, many of you will know that Randy Pausch passed away on July 25. He was the leader of the research team behind Alice and a remarkable person. If you missed his “Last Lecture” recorded at CMU last fall, give your self 1.5 hours to watch it. I also highly recommend his book, The Last Lecture. He had pancreatic cancer but fought long and hard against it. I came across an article in the NYTimes linked to by one of the memorial columns. It’s a list of advice from NYTimes readers of what they wanted their children to know if they were terminally ill. I adored this list. Don’t be rude to the wait staff. If you need help, ask for help. It’s okay to go up the slide, even though the rules say you may only go down. Learn the words “Thank You.” How to say it. How to receive it. I was going to end on a goofier note, but I don’t think I can follow that list, so I’ll save the goofy for tomorrow. I use Google Reader on a daily basis to read through a bunch of news and headlines, marking the ones of interest to come back to. Often I feel the need to share these with a wider audience and end up sending them to my parents, brother, Ben, or Simon the Anglophile. So I thought I could just make my own blog and link to the really interesting/bizzare/cool/crazy news of the day. I won’t necessarily have read the article, but the headline caught my eye. This isn’t NPR on the hour, this is my own personal mix generally from the NY Times, The Minneapolis Star-Tribune and the wonder that is Slashdot.